Years ago and back in the old country they had plenty of cottontails. It was always a special treat then to submit to the kitchen a bunny with no pellets and no bullet hole. Hunting them, and pigeons as well, with a rimfire rifle was – and always will be – a lot of fun. As far as I know it was RWS who first came out with subsonic .22 ammo specially for hunting, meaning featuring a hollow point bullet. The stuff was an instant hit because the reduced noise is a blessing to the shooter’s ear, and to others in more densely populated places such as Germany. When I arrived here in Arizona for good in 1980, nobody carried that subsonic ammo. But after a few years the stuff began to show up on local dealer’s shelves – sometimes, and at a price. So I made it a habit to pick up an occasional box. Again, I believe RWS was first. Next I found the Fiocchi version. It shot fine, and was cheaper, so I even bought an entire brick. I’d say Remington was the first American manufacturer to offer subsonics, and at the lowest price. Apparently I used them most and saved the imports. Plus I maintained the habit of picking up an occasional box if new stuff showed up. Note that my selection became quite international. And if you thought that the Winchester box is made in USA, you are at least 15 flight hours off. “Made in Australia” reads its label. I suspect it may be the deadliest of the bunch, having the largest flat nose (meplat) around its hollow point. I never found another box, probably never will. By an insignificant margin it was also the most accurate hunting/hollow point ammo. I should have bought more, back some 20 plus years ago. The RWS stuff must be about 30 yrs old. Sub-sonic ammunition has recently moved more into focus, thanks to the ever-increasing trend to equip firearms with suppressors. When I learned that Arizona changed its rules and now allows legally-owned suppressors for hunting, it was time to get involved. My application for a can from Sig Sauer is in the system. Since I may also, somehow, come up with 5/8-24 threads on my CZ 452, is was a good excuse to round up all the various ‘weird’ 22LR ammo and see what the CZ can do with it all. Test plan was simple: load one mag with 3 rounds as fouling shots, and to make sure point of impact was basically on the target, then switch to a 10-round mag and fire those ten from bench rest at a distance of 50 yds. Here are the results, in picture and Table. Note that the labeling here ended up being reversed. 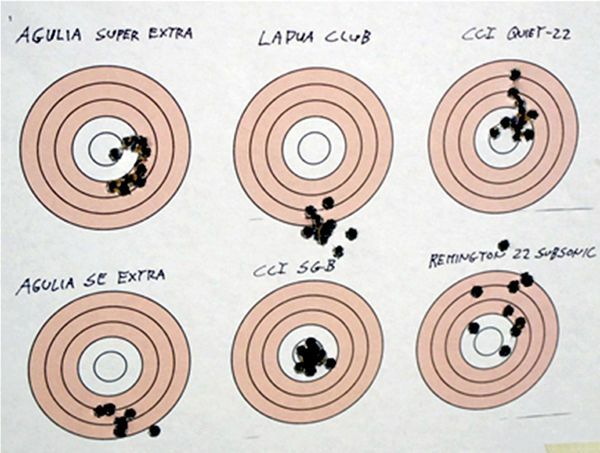 The CCI Quiet 22 dropped so much that they landed on the lower bullseye. So I shot the upper with the Rem Subsonic ammo. I also aimed low to make the CCI SGB’s hit center. 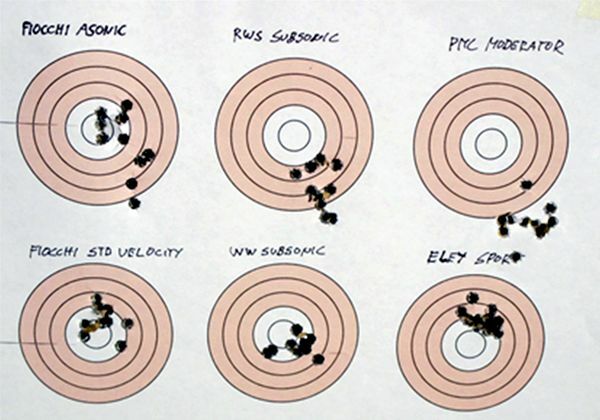 To be fair to the ammo and admitting that my bench rest skills are far from perfect, I also listed an “8-shot” group size by dismissing the two worst shots of each 10-shot group. Note that I included a few non-hollow-point types. 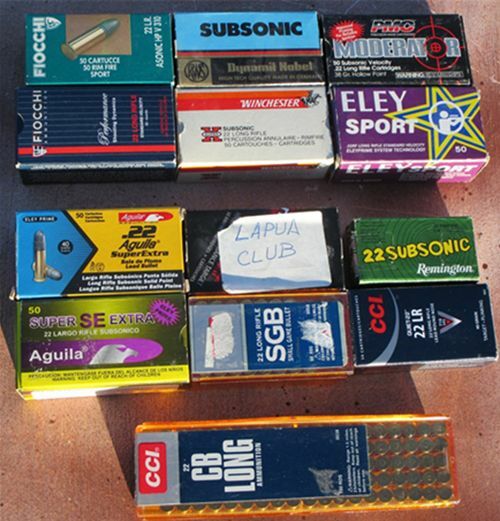 Thanks again to Dan for the Lapua Club partial box which had given erratic results in his rifle. And of course the CCI ammo really does not belong. 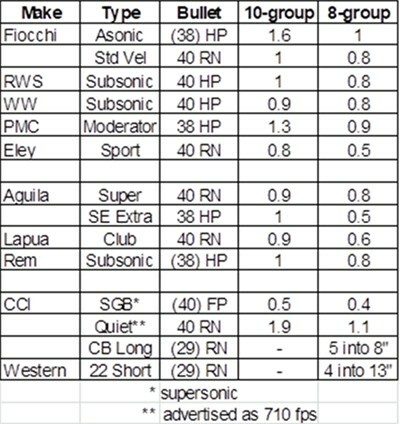 Their Small Game Bullet (SGB) clearly stepped out supersonically (every other ammo tested here exited with subsonic speed), had noticeable more recoil, too. But that CZ surely liked it! And I would not recommend “Quiet-22” for hunting unless through your gun it will guaranty a head shot each time. My rifle did not like the CB Long stuff at all. And some random 22 Shorts I’d gotten from somebody in a plastic bag sprayed even worse. I did not want to do most of all this over again in my Ruger 10-22. But I did do the spiel once with the Remington Subsonic fodder (1.3” and 0.9”). The 13 shots went without malfunction. We all know that 22 rimfire ammo availability is currently as reliable as the weather forecast. OK, not even. Of the ammo types tested here, most are probably NOT available at present. But I’ve seen the RWS and Remington Subsonics offered by Natchez more than once in recent times. 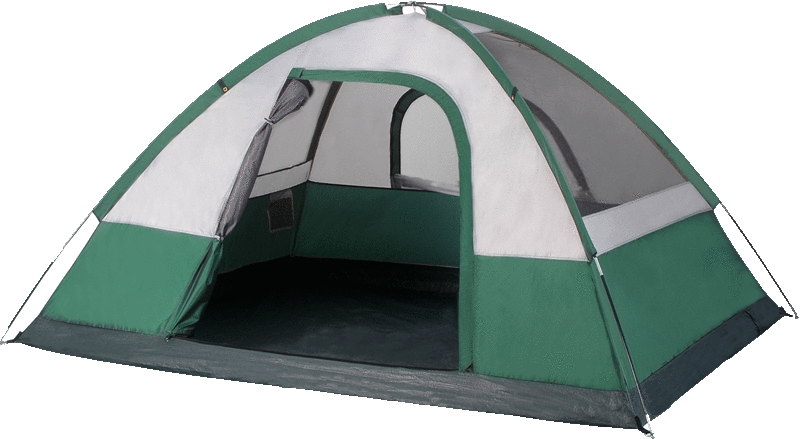 And Sportsman’s might even have the Aguila right now … just in case you’re interested.